State Capital of West Bengal in India, Calcutta has a population of over 4 million, more than 15 million if including the entire conglomeration. Situated in the Ganges delta, Calcutta is built upon wetlands and enjoys a tropical monsoon climate which adds a high humidity to the city’s high pollution level. 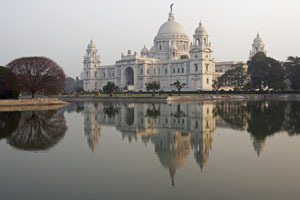 A major cultural centre, the city is the birthplace of several well known authors such as Rabindranath Tagore. It also possesses interesting historical heritage buildings such as the Temple at Dakshineshvar, the Temple of Kali, the white marble Victoria Memorial, the Birla Temple, Saint Paul cathedral, the Church of Saint John surrounded by its own park, the Botanical gardens with their giant Banyan tree (one of the two tallest in the world), and the quarter around the College Street Coffee House with its numerous book stalls; the meeting place of the Bengali intellectuals from all areas. Other places that should not be missed include the Vidyasagar Bridge, the Indian Museum and Howrah Bridge. However, despite its title of Cultural Capital of India, Calcutta will above all astonish you by its overpopulation; the sober misery contrasting sharply with the bright colours, the despair and charm are closely intertwined as is often the case in India.